This morning we were all ready on time! Miracle #1. We combed Max’s hair (he grins from ear to ear when we do that … even though his hair is so thick and matted that it hardly looks any different… so cute!). Tru was being nice. Zuzu took a nap before 1:30 church. Yay! So, we quickly gathered the tots for a photo. My thought… wow, these are missionaries in training. Miracle #2…. everyone smiled nicely for the photo. No shoving! Today we wrote letters to Jim & Trev … cousins on missions! They are such great examples for my kids! We are thinking MISSIONARY this week! Tru was all ready to go on his mission after dinner one night when we were talking about missionaries. He had no idea what he was signing up for – but he wanted IN! Max still wonders out loud where he will go on his mission. He says things like, “Grateful we can have blessings from Jesus when we are sick” in his prayers. He will be a solid missionary someday! Hannah has calculated the amount of time between when she and Abe will leave. She is wearing an anklet, which she wants to wear until she leaves on her mission… a reminder to prepare. Abe is going to be a missionary filled with the Spirit of God. He will touch so many lives. Zu-Zu. She is a great every-day missionary by sharing her light! We are working on COURAGE! Bully-protection training happened tonight. You shouldn’t need bully-protection training because of boys in your primary class at church. We are teaching WORK! This area is discouraging to me. Oh, how we try to teach the tots to work without immediate reward… and how to do a job right the first time – thorough. But kids are still kids… They have many moons until they grasp this fully (wait – have I grasped this fully?!). But by golly… they will know how to do dishes, clean toilets, and cook a few things before they leave home! BUT … I love when the kids have an ah-ha moment. I gave Hannah & Abe this list I found on pinterest. I’ve sat down with Abe a few times to review a few, when he’s having a hard time trying to calm down. The other night he had a scary dream and he finally read his scriptures and was able to go to sleep. I love that he thought of that. 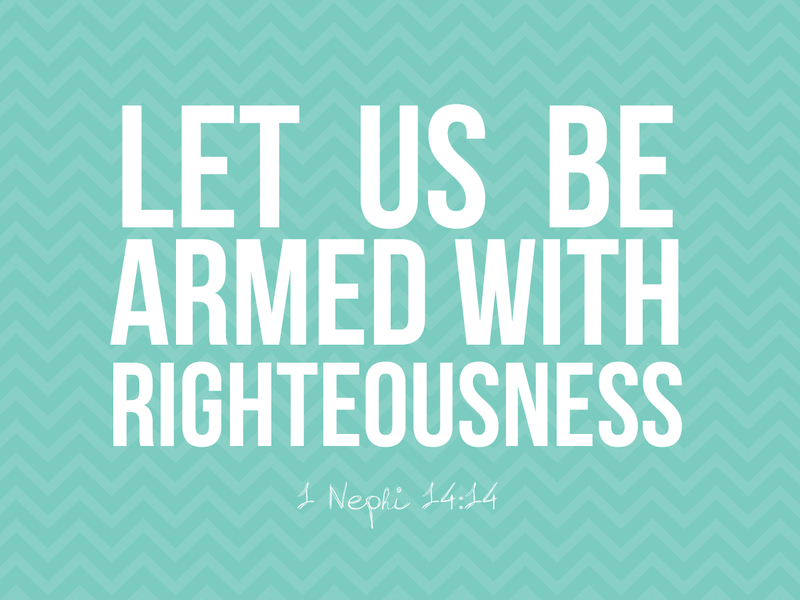 We might be doing something right – rather … the Holy Ghost is! Well… this is a random post. Quickly worded. I may revisit this idea. to prepare our children to be more like Christ? 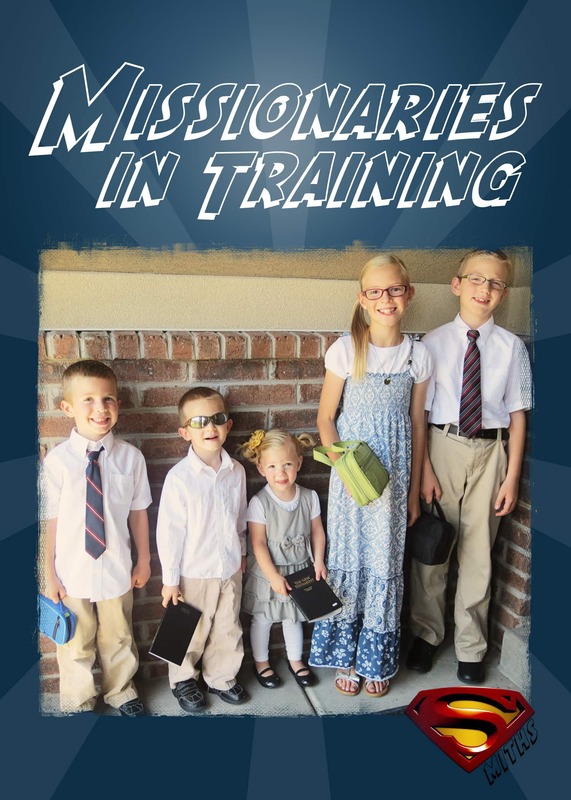 to be stronger missionaries in every day life? to look towards the temple? 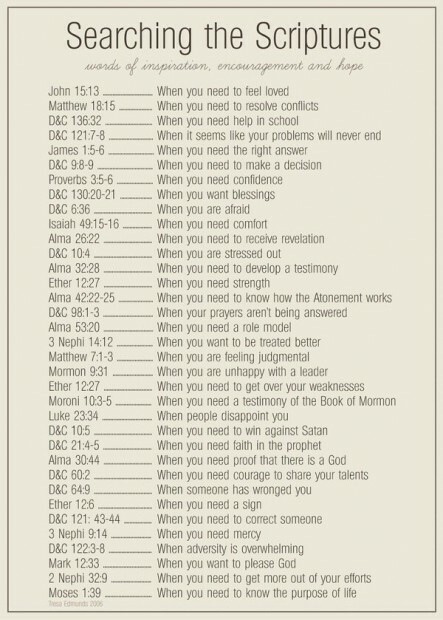 to help them know who they really are! Wednesday evening was our last night in Seattle. 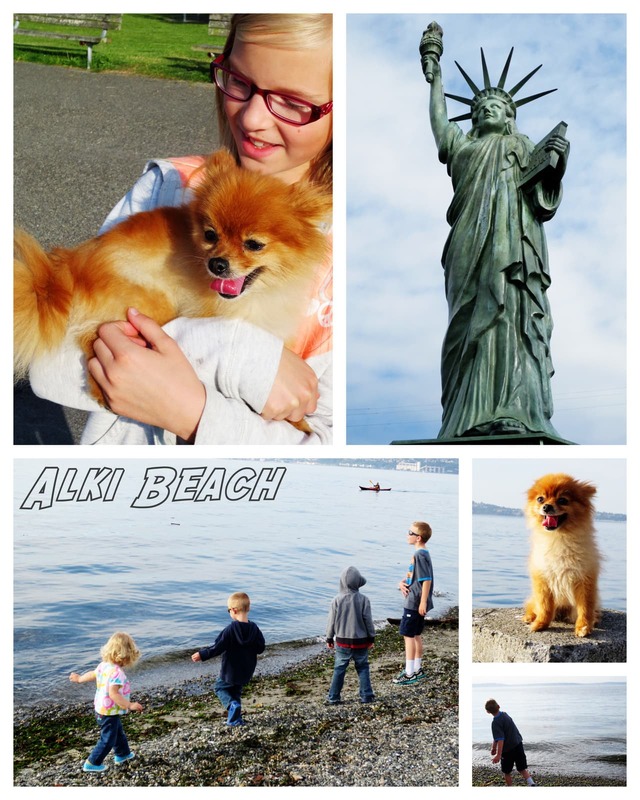 We drove to Alki Beach. Alki Beach is the site of the landing of the first white settlers in Seattle on a cold, stormy day in November of 1851. Chief Seattle and his tribe greeted them and helped them build their cabin to stave off the cold, wet winter. We saw a miniature Lady Liberty that was cool. The Statue of Liberty, a small replica of the original “Liberty Enlightening the World” in New York City, was a gift from Reginald H. Parsons and the Seattle Council of the Boy Scouts of America in 1952. This beach was mostly rocks. It had a sandy portion with volleyball nets. There were tons of seagulls, people, and dogs. This little dog was the favorite. Liza loved it. It went after a husky (brave little thing!). The kids loved throwing rocks again. Even Liza was very bold and slowly made her way right to the way (well… actually toes in the water!). She can’t throw far and she’s realized that to hit the water, she has to be close. Being in nature is just plain good for our family. We did barely see the Alki Beach lighthouse. I had to do some running around to catch a peek beyond government fences. Oh well… I do love lighthouses and the symbolism. 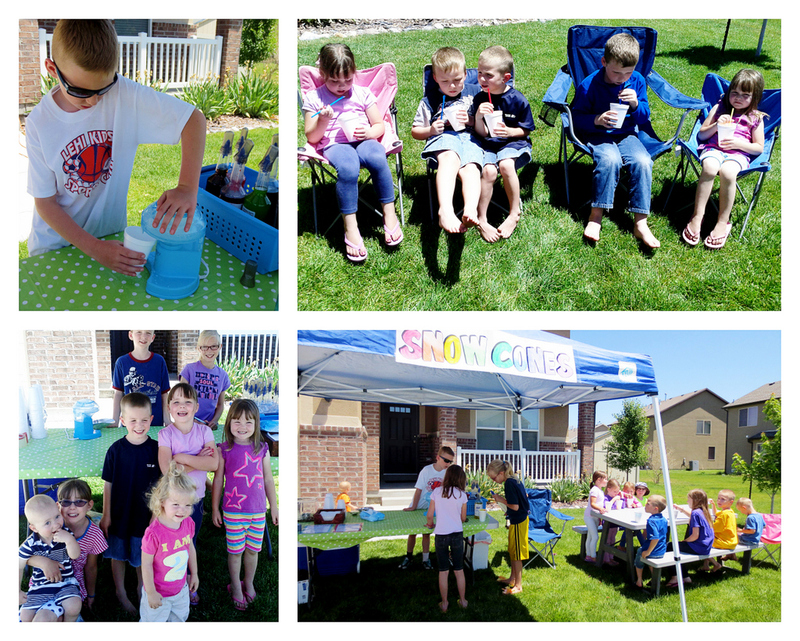 We’ve had 2 snow cone Thursdays thus far. The first one was a little rocky with Hannah & Abe figuring our their jobs. But by the end they had their responsibilities balanced. We were all wiped out tired. But it was fun. Fun to have friends come visit. Fun to share a yummy treat. Last Thursday was really hot. Everyone who walked was melting by the time they got here. We completely ran out of syrup for day #2. Oops. Nice inventory management mom! But I was hoping to use up the non-preferred flavors – which we did. For next time, we are purchasing Snowie’s concentrates which cost the same as the ready-to-use syrups but you get 4 bottles for the price. Hope that works out well. Overall… it’s fun. The kids keep wanting to do it. We set up a shelter (thanks Pettit for sharing) and a picnic table. The Condie’s have let us use their freezer for additional ice and their table has come in handy. We have lots of little Condie’s helping out. Hannah & Abe have worked hard. They think it’s much more fun to work for other people. We’ve done it in the afternoon when Liza is napping. Tru usually goes and plays the wii inside for quiet time (I know – not the best quiet time ever). Max runs around with the kids or the Condie’s. Fun times! We’re hoping to have 4 more snowcone days after our trip. We’ve about broken even – cost-wise. We’ve paid off the 1st round of syrups + the ice shaver. We’ll pay off the second round of syrups next time we host. We’ve had 50-60 people come to the snow cone days. In the end, we might even come out ahead with $. In a recent stake R.S. fireside with Hilary Weeks, she focused on how powerful our thoughts are in creating change and action in our life. 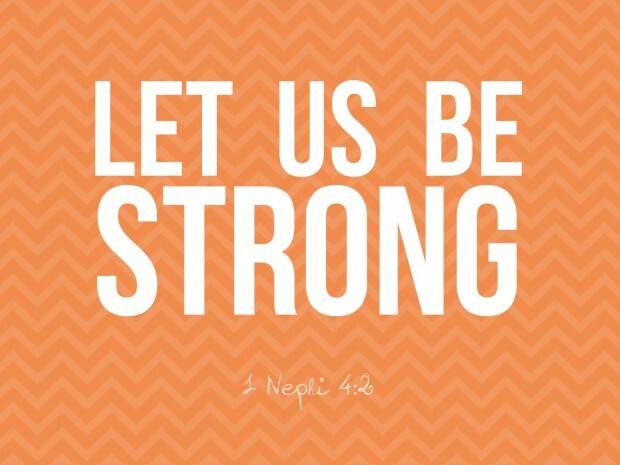 She mentioned Nephi … who used his WORDS to teach faith, courage, and strength of character. She went through the scriptures and highlighted the Faithful & Positive Statements by Nephi. I started doing this in my reading. He focused on faith, repentance, the Savior’s atonement and mercy, courage, strength of testimony. It helps me realize that talking about all the gunk and fear and worry of life is draining… talking about faith and God’s wisdom and blessings INSPIRES positive thoughts and actions. I want to be like Nephi. Yep. I do. A few weeks ago we had an FHE about putting on the whole armor of God. It was a normal family home evening meaning: Tru was all over the place trying to spit on people, Max was trying to get away with all sorts of shenanigans and acrobatics on the couch, Liza was wandering around, Hannah & Abe were reading the scriptures as part of the lesson and trying to focus on the lesson, Mom & Dad were trying to Keep Calm & Carry On, Carry On, Carry On. We ended the lesson wondering if anyone caught the vision of the message. A few days later Max was saying his bedtime prayer and said, “Grateful we can put on the Armor of God.” What?! He was listening. Ah-ha. And this is why we keep having family home evening – because some glimmer of light may enter those ears and resonate in their hearts. This is our hope. do you see this? my gmail inbox. a few days ago it had nearly 6000 messages. i archived them all. hope nothing was too urgent. it’s so nice to clear it out every day so I don’t get a jumbled mind wondering who I have forgotten to respond to. I’ve also cleaned house on facebook… and google reader. simple… fewer distractions… it’s a fresh start. i’m mentally working on a fresh start here at home (with Jimmy’s help) so we can have fewer distractions/clutter and a more simple life. it might take me a millennium to pull it off. but – a fresh start is always a good thing. 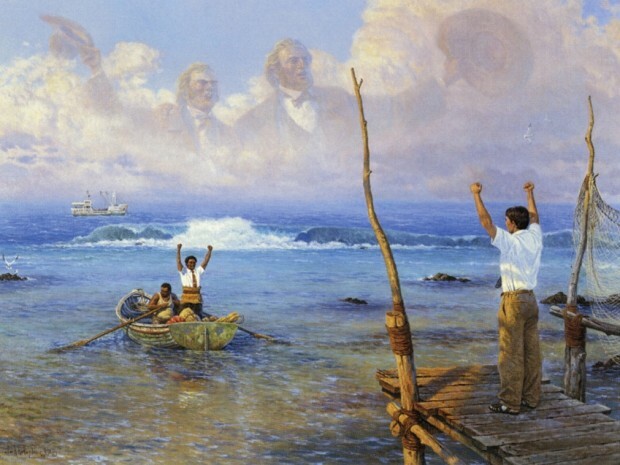 “‘September 14th, … President Brigham Young left his home at Montrose to start on the mission to England. He was so sick that he was unable to go to the Mississippi, a distance of thirty rods, without assistance. After he had crossed the river he rode behind Israel Barlow on his horse to my house, where he continued sick until the 18th. He left his wife sick with a babe only three weeks old, and all of his other children were sick and unable to wait upon each other. Not one soul of them was able to go to the well for a pail of water, and they were without a second suit to their backs, for the mob in Missouri had taken nearly all he had. On the 17th, Sister Mary Ann Young got a boy to carry her up in his wagon to my house, that she might nurse and comfort Brother Brigham to the hour of starting. “‘September 18th, Charles Hubbard sent his boy with a wagon and span of horses to my house; our trunks were put into the wagon by some brethren; I went to my bed and shook hands with my wife who was then shaking with a chill, having two children lying sick by her side; I embraced her and my children, and bade them farewell. My only well child was little Heber P., and it was with difficulty he could carry a couple of quarts of water at a time to assist in quenching their thirst. “‘It was with difficulty we got into the wagon, and started down the hill about ten rods; it appeared to me as though my very inmost parts would melt within me at leaving my family in such a condition, as it were almost in the arms of death. I felt as though I could not endure it. I asked the teamster to stop, and said to Brother Brigham, “This is pretty tough, isn’t it; let’s rise up and give them a cheer.” We arose, and swinging our hats three times over our heads, shouted: “Hurrah, hurrah for Israel.” Vilate, hearing the noise, arose from her bed and came to the door. She had a smile on her face. Vilate and Mary Ann Young cried out to us: “Goodbye, God bless you!” We returned the compliment, and then told the driver to go ahead. After this I felt a spirit of joy and gratitude, having had the satisfaction of seeing my wife standing upon her feet, instead of leaving her in bed, knowing well that I should not see them again for two or three years’” (Orson F. Whitney, Life of Heber C. Kimball, Salt Lake City: Bookcraft, 1967, pp. 265–66). Jimmy and I hope to raise children who will RISE UP and stand for Israel. 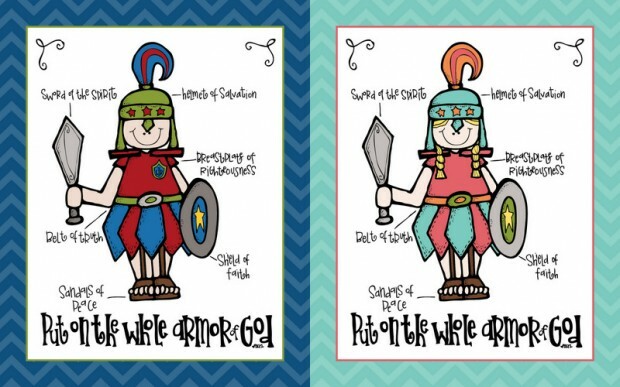 I created these priesthood themed prints to hang in my boys’ room. Hopefully they will read them and be inspired. https://www.jimmyandheather.com/wp-content/uploads/2013/10/200-x-100-logo.jpg 0 0 Heather https://www.jimmyandheather.com/wp-content/uploads/2013/10/200-x-100-logo.jpg Heather2012-12-21 21:40:242012-12-21 21:42:51Hurrah for Israel! 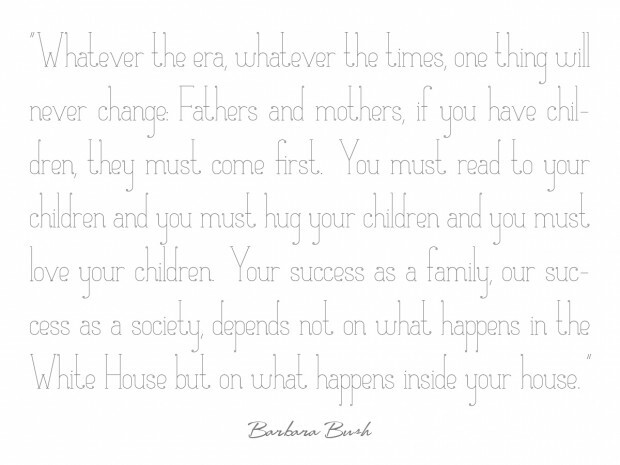 My friend Katie shared this quote by Barbara Bush on facebook today. I LOVE it! 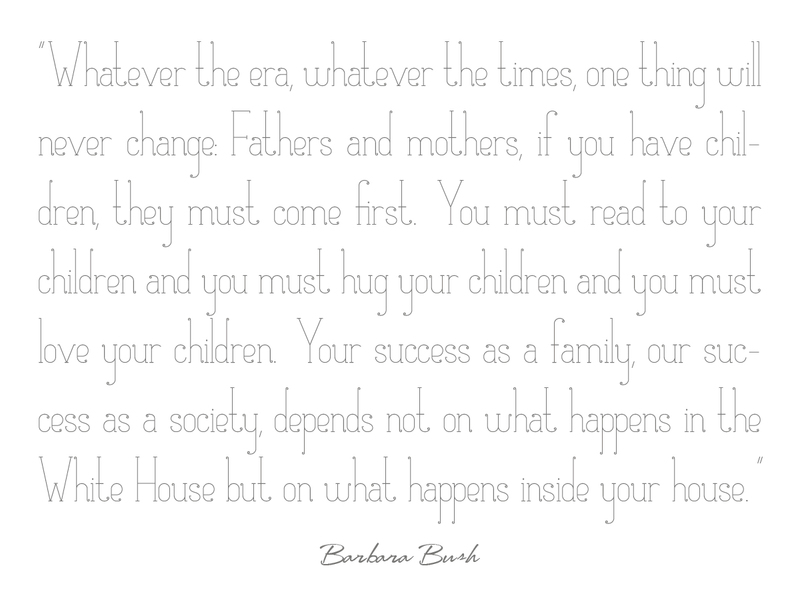 Yes, what happens in our country affects us each and every day … but in the end, TRUTH WILL PREVAIL … our success as a family depends on our personal righteousness. Oh how I want us to BE STRONG. These are the latter days. 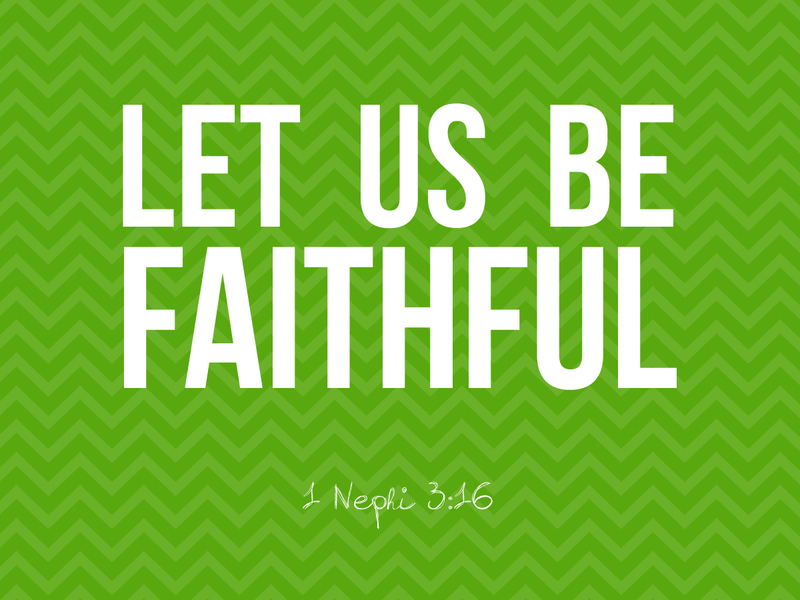 Heavenly Father knew things would get tough so he gave us tools to be faithful. This year our family has been focusing on Temples – and building a little temple fund to donate to the Church. I hope my children realize that the Temple strengthens us with might … to do right … no matter what is going on around us. It will take strong people to battle those in the tall and spacious building. 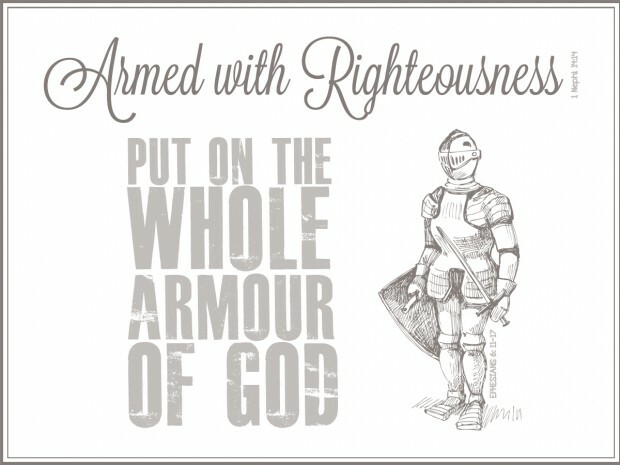 I’m excited for our 2013 Family Theme: Armed with Righteousness. This is a perfect time to teach our kids about being courageous for all that is virtuous and true. I feel an urgency to focus on this even more than we have. These are desperate times. Satan is a booger and is fighting hard. But we can fight harder because GOOD is stronger…. it’s eternal. Teaching spiritual preparedness, temporal preparedness, hard work, sacrifice, faith in Jesus Christ, optimism (i know – you’re doubting my optimism after that last Presidential Election post of mine). But there is more we can do to teach our little barnlings to be STRONG in righteousness. I love this challenge for myself as a mother.